Infiniti - Nissan's unit specializing in the production of class "luxury" cars, mainly for the United States. The characteristic difference - branded grille. Founded 1989. In full possession of the Nissan group. In the mid-80s Nissan Motor in the strictest confidence to begin designing and preparation for the production of fundamentally new high-end car for the North American market. History is silent about the authorship of this idea, but the model Infiniti Q45 was introduced in 1989. Since the autumn of 1996 came the development of completely original Q45, which is offered with a new design and a V-shaped 8-cylinder engine capacity of 4.1 liters. Infiniti expands its lineup, including his car all terrain QX4 - a luxury all-wheel drive version of the Terrano model. The compact front-drive Infiniti G20 is designed to Primera platform. After the 1998 radical restyling of the car began to use again in steady demand among buyers - middle-class Americans. The transverse mounted 2.0-liter engine develops 140 hp. Introduced in 1999 Infiniti I30 (Cefiro / Maxima latest generation platform) has been recognized as one of the best of modern cars in North America. 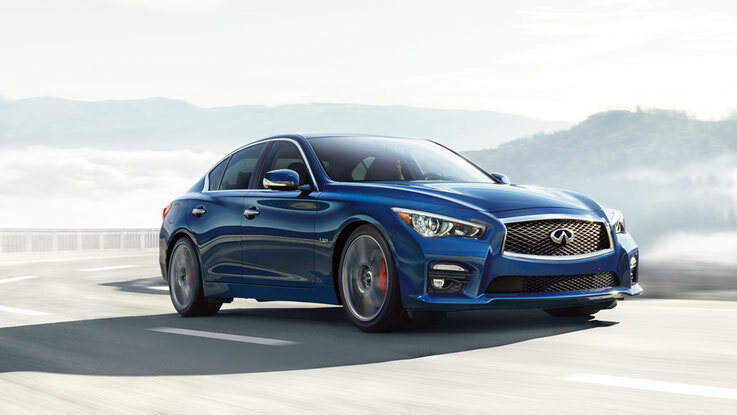 Traditional luxury brands for interior and perfectly tuned chassis complemented perfectly balanced 240-horsepower 3.0-liter engine easily accelerates to 240 km / h. In Europe, Infiniti I30 is not supplied. Q45 flagship presented in 2001 at the New York Auto Show. The massive and at the same time, an aggressive body design is intended to emphasize respectability: from the original elements can be noted large trapezoidal headlamp reflectors, wide chrome radiator grille and a very high line of the side glass. Salon trimmed with expensive grades of leather and wood. Rear-wheel drive models are equipped with a new V8 engine 280 hp and adaptive automatic transmission. 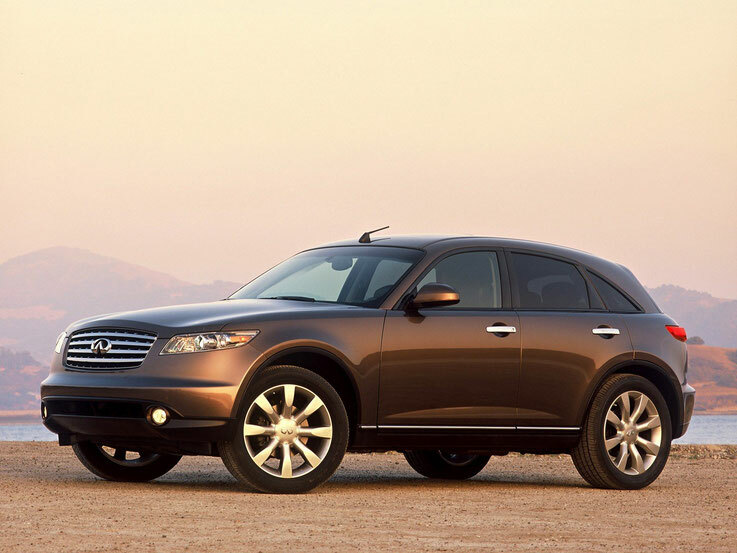 For fans of "luxury" off-road vehicles under the Infiniti brand sold QX4 - a modernized version of the popular in the North American market, Nissan Pathfinder model with a luxurious, finished with natural leather interior and a representative appearance. Inline 6-cylinder engine rated at 170 hp It provides a good dynamic performance, but from the competition, offering as under the Infiniti brand's top models in this class off-road vehicles with 8-cylinder engines, the QX4 does not look so bright. Infiniti FX45 - a sort of hybrid sports wagon and SUV. It will be equipped with 315-horsepower V8 engine with five-speed automatic. Retail price model - 44,2 thousand dollars (a weaker version with a V6 engine called FX35 and will cost less than ten thousand).. As the vice-president Infiniti Mark McNab company, car design was developed in California, and in general it is specially designed for the North American market. The equipment includes a proprietary navigation system on a DVD-ROM, intelligent cruise control, device "smart key" and much more. The American press has already named this car one of the main contenders for the title of best in the class of compact luxury SUV. Next it was exposed to another debutant - Infiniti Triant. The design of this sports coupe made in a futuristic spirit (for example, the doors swing open upward - the type of "gull wing"). The car is packed with electronics, its driving performance is not inferior to many SUVs, and the interior can even be called luxurious.